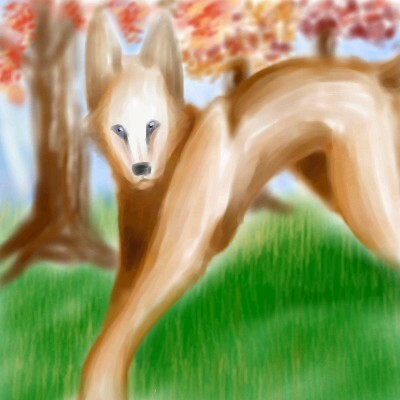 2draw.net - boards - Intermediate - Wolf in park. What is so wrong about brown treetrunks? Go outside and take a good look at a tree trunk. They're not brown, they're grey. 'Cept for redwoods, and a couple other species. But most tree trunks are grey. No. It's brown. Dark brown. You're just color blind..
Yall are funny! :) Any one tree trunk has a multitude of colors in it, as do most things. I love the eyes on this melty looking wolf-dog thing.